These are the level 10 gymnastics requirements. 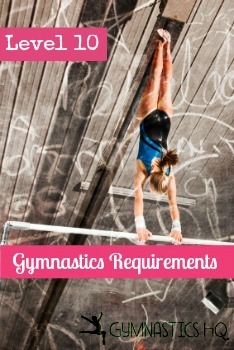 Level 10 is an optional level; learn more about the gymnastics levels here. To compete in level 10 gymnastics a gymnast must be able to do most of the following skill requirements on each of the four events, have scored a 34 All-Around at level 9 and have reached her 9th birthday. If her routine does not have all the requirements listed below, deductions will be applied. In addition to the following requirements, Level 10 routines must have 3 “A” valued skills, 3 “B” valued skills and 2 “C” valued skills. Try walking your hands closer to your feet, lean your shoulders a little bit forward over your hands, then try your kick over 🙂 That’s pretty much what worked for me! Hi. Is a single bar release required for Level 10? Fake also she knows how to spell and why would she promote herself and she quit and why would she even be on this website? How do I get better at gymnastics when I practice at home, school, park and at gymnastics classes?? Usually the rule of thumb for getting into college gymnastics is that your gymnastics level should be the same as your grade. (so 3rd grade, level 3 and 7th grade, level 7 etc.) Scince most colleges would recruit you in your sophmore or junior year of high school, I would say that depending on your gym and how fast girls at your gym normally move up, you could still have a chance at college gymnastics, even though you would probably have to skip a level or two. Very unlikely but if you train really hard for maybe 20 hours a week or more you might be able to. They are only making fun of you bc your amazing, and their jealous! I would love to be level 8 but sadly I know that will never happen. Please don’t quit when you are so good, trust me if your friends don’t support your gymnastics than find better friends. P.S I’m only level 5 and would not quit bc of a friend, their not worth it. Hi. I am level ten. If anyone needs help of advice just ask. How do level up faster? I practice all the time but just can’t get past on skill, my standing back tuck. Is there a specific way to get it faster? ok so i want to start gymnastics and i’m. it like 7 i’m older so i think i would be in level 7 on the floor. so could i be in different levels for different things because i’m best at the floor but like i don’t really know the skills what would happen? Hi I’m going into 8th grade (13) and I can only do back handsprings and backflips on a trampoline, but I have my Ariel and front walkover/handspring I. The ground. If I start gymnastics will I be able to make a team and/or get my skills on floor? All gyms are different, most wouldn’t let you join team with those skills, but yours might be different. I need to get moved up? I can do all the requirements. How do you get a back tuck I’ve tried for a year. Sometimes I get it and sometimes I don’t. Practice, and don’t give up, also make sure you know how to properly shift your weight and control it every time. What level are you? I’m level 10 so back tucks are like SO easy for me!